MTV will review the top 20 ranked Bay Area artists and select 3 to spend a day with MTV2 cameras. Performances and interviews will air nationally during Bay Area week on MTV2 and on Comcast Local On Demand. Artists can only submit one song into the competition and must be thirteen (13) years of age or older at the time of entry. Artists must be a member of the Bay Area to enter. 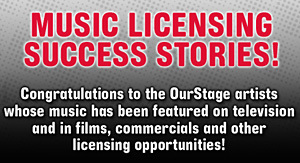 For more info visit the OurStage FAQs .